Poaching eggs can seem like a daunting task. How exactly do we make a "tornado" in barely simmering water? Plus, offering them to a crowd is always tricky. Luckily, there's an easy way to poach a lot of eggs at the same time. Awesome! What do I need? In lieu of a saucepan, grab a non-stick muffin tin. You'll also need a dozen eggs and cooking oil. Sounds simple enough. How do I do it? Preheat the oven to 350°F. Spray the muffin tin with cooking oil and add a tablespoon of water to each cup. Then crack one egg into each compartment. Bake for about 13 minutes, or until the egg whites have set, but the yolk still looks runny. 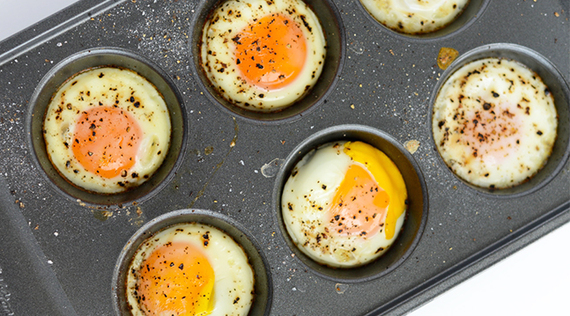 If you like your yolks more well-cooked, let the eggs bake for up to 15 minutes. That's all!? Yes! It's that easy. Be warned that when the eggs bake, the water will rise to the top, so the whites may appear to be runny and uncooked--but probably aren't. Just spoon them out of the muffin tin after about 13 minutes and use a finger to make sure the whites are set. And they really taste the same as poached eggs? You bet. In terms of taste and texture, we couldn't tell the difference.